Journalist and author Dr Austen Ivereigh participated in the Helder Camara Lecture Series at Newman College last week, exploring how Pope Francis is leading the Church in discerning its responses to the challenges of our age. Dr Ivereigh is a fellow in Contemporary Church History at the Jesuit-run Campion Hall at Oxford University. A former assistant editor of The Tablet, Dr Ivereigh has written two biographies on Pope Francis — the first published in 2014 and the second to be published later this year. The Pope’s role, he said, is to help the Church open itself up to the grace that is being offered in our current time, openly facing and confessing its sin and failure and re-centring its mission on Christ. The dynamic of feeling God’s mercy and then being able to reach out to others with mercy was one that Bergoglio himself experienced early in his life. ‘The experience of shame and grace, of being forgiven, taken in and sent out, would turn him around, and this would be the template of his teaching: how the grace of shame opens us to the experience of mercy, and mercy leads into mission’, said Dr Ivereigh. Ivereigh noted that in January last year, Pope Francis held up St Peter as another example of a sinner who experienced mercy, and was able to then go out on mission for Christ. Rather than a moralist, clericalist Church, Ivereigh argued that Pope Francis is trying to build a Church based on proximity. It’s not enough to put forward rules and expect people to follow them. Pastors need to be close to people, to accompany them in the messiness of their lives. Dr Ivereigh said the abuse crisis provides people in the Church with a chance to face the truth of their failures, to open themselves to God’s grace, so they can take seriously the missionary discipleship of the people of God. ‘The Church has been plunged into desolation, both in its response to secularisation and by the revelation of its own failure. Yet Francis’ words are of consolation. Dr Ivereigh’s lecture on Thursday was followed by a seminar on Friday, featuring Dr Ivereigh in conversation with Fr Frank Brennan SJ, Ms Marcelle Mogg, and Bishop Terry Curtin. 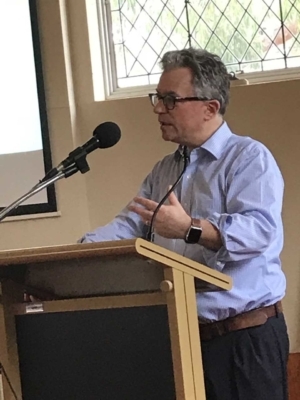 The seminar, titled ‘Francis — A voice crying out: Becoming a Humble, Listening and Learning Church’, offered an opportunity for conversation around some of the issues facing the Church in Australia following the Royal Commission and in the lead-up to the 2020 Synod.